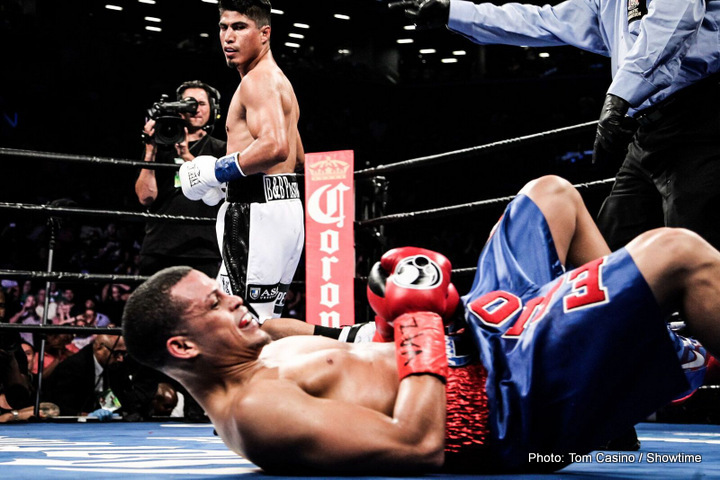 On Saturday night, July 30, 2016, twenty-eight year old professional boxer Mikey Garcia returned to the ring at the Barclays Center in Brooklyn, New York, after a two and a half year layoff due to a contract dispute with his former promotional company, Top Rank. On the Showtime televised broadcast, Garcia knocked down former WBC World Featherweight Champion Elio Rojas four times, before referee Eddie Claudio called an end to the fight at 2:02 of Round 5. Following Saturday’s TKO win, Garcia’s record improved to 35-0, with 29 KOs, while Rojas’ record dropped to 24-3, with 14 KOs. Garcia-Rojas was scheduled for ten rounds in the junior welterweight division as the co-main event on the fight card promoted by DiBella Entertainment, in association with Cyclone Promotions, and presented by Premier Boxing Champions. In the main event, Carl Frampton won the WBA Super World Featherweight Title by defeating Leon Santa Cruz by majority decision. Garcia, a former two-time WBO world champion in the featherweight and super featherweight divisions, last fought on January 25, 2014, when he successfully defended his WBO World Super Featherweight Title in a unanimous decision win against Juan Carlos Burgos on HBO. In October 2014, he vacated the WBO World Super Featherweight Title because he had plans to move up in weight. Mikey grew up in Oxnard, California, trains in Riverside at the Robert Garcia Boxing Academy, and resides in Moreno Valley. He shared his thoughts about his winning performance against his opponent, Elio Rojas. “It took me a round or two to get my rhythm going. I had to find that right distance and range to connect my punches. I didn’t feel any ring rust. My defense and footwork were fine, my punches felt sharp and fast, and I felt good with my jab. My opponent used the ring well and demonstrated solid footwork. The plan was always to keep my distance and measure him. It was difficult to land that one big shot, because he kept moving and using his legs. He was smart and he wanted to win. Rojas had good reflexes, and he was able to see me coming in. He kept moving out of the way before I could land a big punch. I worked hard to close the distance, and when it happened, I let my hands go. Once I started landing hard shots, I knew that I hurt him, and eventually he went down. Mikey discussed his career going forward. “During the past two years, I never went away from boxing. I’ve stayed busy helping other fighters get ready for their fights, and continued making improvements in the gym. I had good sparring prior to this fight, and I had adequate time to prepare. It’s very important that I get right back in the ring again soon. I didn’t have any cuts or abrasions, and my hands feel good. I’m ready for a world title fight right away at 135 lbs. I would love to fight for the WBO World Super Featherweight Title, which is currently held by Terry Flanagan of the UK. If the world title opportunity isn’t available, then I want to be back in the ring as soon as possible so that I can stay active. My next objective is to challenge for a title at 135 lbs, then perhaps unify titles in that division if the opportunity presents itself. After that, a move to 140 lbs would be likely, and I’ll seek world title opportunities there. I’ll target big names and the big fights that fans want to see. There are plenty of big challenges ahead of me. Because of the time away, it’s important to me that I’m moved on the fast track, so that I can face champion after champion. Now that the Rojas fight is over, I plan to resume conversations with boxing promoters. I’m still a free agent and am willing to negotiate a deal if it is in my best interest to do so. I want to thank Stephen Espinoza, Al Haymon, and Lou DiBella for giving me the opportunity to fight on Saturday night. I also want to thank my sponsors: B&B Plastics Inc., Asanti Wheels, and Everlast. It feels great to be back, but there’s so much more I want to accomplish. This is just the beginning, and I will do my best to give everyone memorable fights. The time off helped me regain that fire, and it motivated me to come back stronger. I’m thankful for all the fan support I’ve received. My performance on Saturday night hopefully reminded everyone what I’m capable of doing inside the ring, and it’s a great way to begin this next stage of my career.